The VA home loan program is a mortgage-backed guaranteed by the U.S. Department of Veterans Affairs. This loan program is designed to provide special benefits to Arizona vets as well as the surviving spouses of veterans. VA home loans provide a number of homeownership opportunities with no down payment needed in Phoenix, Scottsdale, Flagstaff and surrounding areas. The government-backed VA loan is available to active duty military personnel, honorably discharged veterans and their widows. This is one of the last remaining mortgage programs that still allow home buyers to purchase a home with ZERO DOWN PAYMENT. Certain guidelines must be met by lenders and banks wanting to offer VA loans. Below we will discuss some important things eligible Arizona home buyers will want to know about getting pre-approved for a VA loan. Getting a VA mortgage qualification letter prior to looking for a new home with an agent is an important step in the home buying process. The pre-approval letter will provide the loan applicant with an idea of their qualifying amount, monthly expenses and down payment requirements. Additionally, the pre-approval letter gives the seller and realtors involved a better sense of security and confidence that the purchase contract will be able to close on time. There is a big difference between a Pre-Approval Letter and a Mortgage Approval Conditions List. The Pre-Approval Letter is generally issued by a loan specialist after a credit check has been performed on the vet applying and income and assets docs have been reviewed. The Pre-Approval Letter is basically a loan specialists written communication that the home buyer meets the mortgage program’s guidelines. The pre-approval letters will always be contingent on an acceptable VA home appraisal, pretty much the same as other programs. The Mortgage Approval Conditions List is a bit more detailed, especially since it is usually issued by the underwriter after an entire loan package has been reviewed. Getting a VA loan pre-approval letter for a new home purchase is mainly to let everyone involved in the transaction know what type of mortgage financing the buyer is approved for. Sellers will want to know if the loan approval is for a VA, USDA, FHA, Jumbo or maybe a Conventional loan. The Pre-Approval Letter is based on loan program guidelines pertaining to a applicants debt to income (DTI) Loan to Value ( LTV) Credit, Property Type and occupancy status. A complete VA Pre-Approval letter should let the borrower know the exact terms of the loan amount, down payment requirements and monthly payment, including principal, interest, taxes, insurance and any additional mortgage insurance premiums. Lender Contact Info – Broker, Bank or Lender’s Name and Address, Phone, etc. Status Date and Expiration Date – Most Pre-Approval Letters are good 90 days from when your credit report was run. After 90 days borrowers should contact the lender again to update any changes. Mortgage Type – FHA, VA, USDA, Conventional, Jumbo loan. Loan Payment Term –30, 20 or 15 year fixed, ARM (Adjustable Rate Mortgage); if ARM, 3, 5, 7 or 10 year initial fixed period. 100% Financing, No Down Payment Required. Most conventional loans require that borrowers pay 5% to %20% of the sales price in the form of a down payment. For example, if the sales price is $300,000 the borrower would need to present a $15,000 to $60,000 cash down payment up front. The VA loan program requires zero down payment, opening doors to financing that may have been difficult to obtain otherwise. This is especially great in Arizona where 100% mortgage financing is hard to find in 2018. In fact, VA and USDA are the only 100% loan available for Arizona home buyers. No Required PMI, or Private Mortgage Insurance. This fee is often required when borrowers of conventional loans are unable to provide at least a 20% down payment. FHA, USDA loans also require a monthly fee. PMI is designed to protect lenders should a borrower default on a loan. 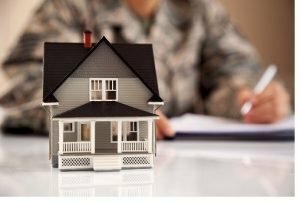 Because VA Loans are backed by the US Department of Veterans Affairs, lenders assume less risk and are able to omit the requirement for PMI. This advantage can end up saving qualified veterans a substantial amount of money. Low 30 yr Fixed Interest Rates. Because VA loans carry the VA guaranty, lenders assume less risk. This enables lenders to offer very competitive interest rates that are often lower than those of many conventional loans. This is especially true for home buyers with credit scores over 720. VA Jumbo loans are available to home buyers that require larger loan amounts. The standard 2019 VA Loan Limit in Arizona are currently capped at $484,350. However, larger VA jumbo loans options are available for loan amounts up to $1.5mil. This program is not 100% financing like the regular VA loan and will require a small down payment. Eligible borrowers can read the complete VA jumbo loan guide here. Easy refinance options – this is great for borrowers that may want to refinance in the future. The 100 VA cash out and IRRRL loan. Please contact us today with any questions, or just submit the quick info request form on this page for fast service.